Low, explosive “chuck.” Song is variable series of bubbling, flutelike notes; faster at end. Description: Sexes similar. 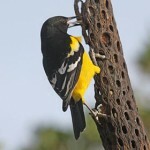 Black V-shaped breast band on yellow underparts; upperparts are brown with dusky edges. Yellow chin and throat; yellow lower half of cheek; brown striping on head; dark streaking on white sides. White outer tail feathers are conspicuous in flight. 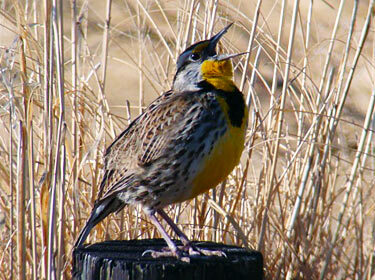 Best distinguished from Eastern Meadowlark by voice. Habitat: Tall and mixed-grass prairies, hayfields, wet meadows, and weedy edges of croplands. Sometimes found in short-grass and sage dominated plains. 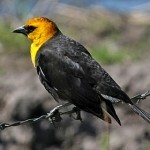 Where in Nebraska: Common spring and fall migrant across the state. Common summer resident almost statewide except in extreme southeastern counties. Winters most regulary in southern Nebraska. Nebraska’s state bird (as well as many other states). 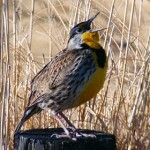 Western and Eastern Meadowlarks were considered to be the same species for a long time. The western species, having been overlooked, was given the species name “Sturnella neglecta“. Hybridizes with Eastern Meadowlarks where ranges overlap.